St Albans Museum + Gallery is delighted to present Barbara Hepworth: Artist in Society 1948-53, a unique exhibition exploring a short yet significant period in the life of one of Britain’s most celebrated artists. Introducing sculptures, drawings and archival material, this exhibition reunites works that have not been seen together since they were first created 70 years ago. Barbara Hepworth: Artist in Society 1948-53 shines light on an important period in Hepworth’s career immediately after the Second World War, when she began to receive wide recognition. This poignant exhibition will be displayed in the hand-excavated Weston Gallery at St Albans Museum + Gallery. On from 23 March, the exhibition will be displayed for 6 months and will be free for all visitors. The exhibition is curated by Dr Sophie Bowness, Barbara Hepworth Estate and Annabel Lucas, Head of UHArts, University of Hertfordshire. It is produced by UHArts in partnership with St Albans Museum + Gallery. This newly curated exhibition explores a time in Hepworth’s career when she viewed herself as an “artist in society”. The phrase which forms the title of this exhibition is taken from the artist’s own writings and reflects her interest in social relations and groupings. It was a time when she was outward looking; both her integration into the community of St Ives and growing national reputation. Following on a decade in which she had been preoccupied with landscape, Hepworth moved naturally between abstraction and the figure. Finding inspiration in the movement of people in various settings, this exhibition showcases Hepworth’s ability to capture the human form: from figures congregating in Venice’s St Mark’s Square and dancers in her new Trewyn studio to medical teams performing operations at hospitals in Exeter and London. 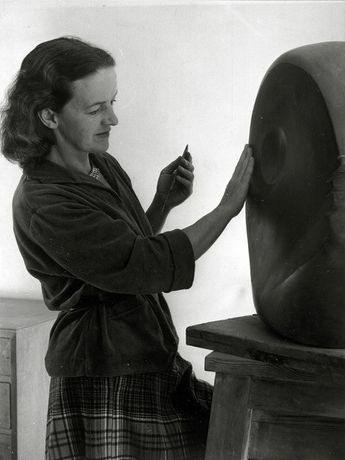 Barbara Hepworth: Artist in Society 1948-53 includes over 100 fascinating objects, showcasing 20 significant works of different media, each shining new light on Hepworth’s craft and renewed focus on the human form during these pivotal five years. The sculptures and drawings presented include loans from Tate Gallery, Hepworth Wakefield, Scottish National Gallery of Modern Art, British Council, University of Edinburgh, Whitworth Gallery (University of Manchester), Pier Art Centre, Hertfordshire County Council and a number of private collectors. Two major sculptures commissioned for the Festival of Britain, Turning Forms and Contrapuntal Forms, were formally relocated to the county when the festival ended. 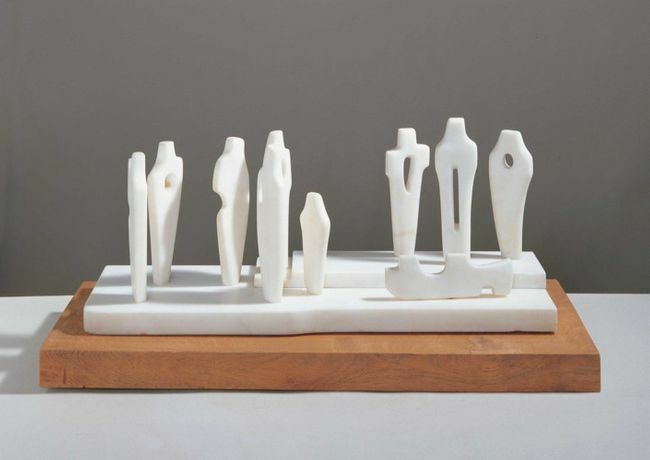 A more intimate piece Eocene was acquired by Hertfordshire Schools Collection (currently displayed at St Albans Girls’ School) and in 1951 Hepworth was commissioned to carve Vertical Forms for Hatfield Technical College (now the University of Hertfordshire). This little known connection will be explored further in the exhibition. As well as Hepworth connection to Hertfordshire, this exhibition will be the first to exhibit the sketch Three Figures - Project for Sculpture. This piece was drawn ahead of the creation of Vertical Forms and adds a new dimension to what we thought we knew about Hepworth’s process as an artist. “It has been such a pleasure to work with UHArts to bring this new exhibition to the beautiful space at St Albans Museum + Gallery. The exhibition shines a light on this short yet significant period at the mid-point of Barbara Hepworth’s career, when she returned to the human form after a decade preoccupied with landscape. Her work is characterised by a fascination with female/male dualities and there is a sustained dialogue between abstraction and figuration throughout. We are reuniting works that have not been seen together for many years to explore the close relationship between her drawings and sculptures, and her connection with Hertfordshire at the time. St Albans Museum + Gallery opened to the public on Friday 8 June. Since then there are have been approximately 10 temporary exhibitions displayed across multiple galleries, offering visitors something new to see every time they visit. This exhibition follows on from Game Plan: Board Games Rediscovered, a touring exhibition from the V&A Museum of Childhood.